The Navy, then a lottery win, changed his life. Expanding education and health care access, says Cisneros, are his goals if elected to Congress. HACIENDA HEIGHTS, Calif. — The afternoon sun is diminishing as Gil Cisneros ends several hours of knocking on doors for votes for his congressional bid. David Morales answers, never stepping out on the porch. Cisneros only has a few seconds to explain his purpose and hook Morales, who says his family is politically divided. “I’m trying to restore sanity to Washington,” Cisneros implores. The energy and anti-Trump sentiment that Democrats are feeling this nonpresidential election have opened the door for political newcomer Cisneros to try to win a seat that could help put Democrats in control of the House. He’s one of eight Latino candidates running in the more than 100 House races that Democrats have targeted in this year’s elections, including nine in California. The others are Mike Levin and Ammar Campa-Najjar, in California Congressional Districts 49 and 50; Debbie Murcasel-Powell in Florida 26; Xochitl Torres Small in New Mexico 2; Antonio Delgado in New York 19; Randy Bryce in Wisconsin 1; and Richard Ojeda in West Virginia 3. As luck would have it, Morales’ parents pulled up as Morales was closing the door, giving Cisneros a chance to connect with a couple more voters. Cisneros knows he’s caught a few breaks that have made life much easier for him, including winning the California lottery eight years ago. But in his campaign for the state's competitive 39th Congressional District — made up of Orange County, part of East Los Angeles County and a piece of San Bernadino County — he says he's trying to show voters that he’s more than a lucky lottery winner. “The question I get more than anything else is: ‘Why are you doing this? You don’t need to do this,’” Cisneros told NBC News. He said his answer is simple. “It goes back to service. I didn’t have to run for Congress. We had a tremendous amount of luck and good fortune," he said referring to him and his wife, Jackie, "and we used that in a way that we could give back and create opportunity for others through education, the same way I received that opportunity." In 2010, weeks after leaving his job as a shipping and manufacturing manager at Frito-Lay, Cisneros stopped for Hawaiian barbecue takeout. That’s when he picked what turned out to be the winning numbers for a $266 million-dollar lottery prize. He opted for a lump sum payout of $165 million, minus taxes. With some of that money, he and his wife formed a foundation and endowed scholarships for Hispanic students at their alma maters, George Washington University and the University of Southern California. They helped fund a leadership institute at GW and partnered with the Hispanic Scholarship Fund and the predominantly Hispanic city of Pico Rivera to create Generation 1st Degree Pico Rivera. Its goal is to put a college degree in every household. There are about 17,000 households in Pico Rivera and about 12 percent of its residents ages 25 and older had a bachelor’s degree or higher from 2012 to 2016, according to the Census. The Cisneros' foundation also has supported veterans programs, including helping to renovate the Bob Hope USO Center at the Los Angeles International Airport. Cisneros is running against Republican Young Kim, a Korean-American former state legislator. In a television ad, Kim said Cisneros doesn’t understand California’s high cost of living, because “he hit a jackpot,” according to a transcript. There hasn't been a Korean American in Congress since 1999. Come November, there could be 4. In the competitive congressional race against Kim, Cisneros refuted allegations from a woman who accused him of inappropriate behavior, which Cisneros and several witnesses denied. On Monday, the woman, Melissa Fazli, tweeted that she had met with Cisneros and it had been a "HUGE" misunderstanding. She said a conservative political action committee running ads against Cisneros had "weaponized" her story and asked them on Twitter to "immediately take down your vile ads." Cisneros grew up in Torrance, California, part of a multi-generational Mexican-American family. His grandfathers were World War II veterans and his father a Vietnam veteran. After the military, Cisneros' father worked at an aluminum can manufacturing plant. His mother, who never finished high school, was a homemaker and at times worked various jobs, including as a middle-school cafeteria worker. Cisneros said he didn't have money to attend college, so he saw the military as the way to advance. He met a Navy chief petty officer recruiter who encouraged him to apply for a program designed to get more people of color into the Navy’s officers’ ranks. Cisneros said that even though he was a good student, he didn't have a network of counselors or mentors to point to opportunities and how to use them. The Navy program helped prep Cisneros for college; he used a Navy ROTC scholarship to attend George Washington, where he earned his bachelor’s in political science. He served 10 years in the Navy, including in the Persian Gulf during Operation Desert Shield, reaching the rank of lieutenant commander. The Navy program "changed my life. It really gave me an opportunity through education I didn’t know existed before,” he said, emphasizing why access to educational opportunities is one of his campaign issues. Cisneros later earned an MBA from Regis University in Denver and, after winning the lottery, a master’s in urban education policy from Brown. About half of the 39 Congressional District’s Latinos were eligible to vote in 2016, according to Pew Research Center. Latinos and Asians in the district are nearly half of the voters, according to Political Data Inc. While Latinos are more likely to vote Democrat, the district includes conservative areas of Orange County and its Asian voters split their vote in 2016, favoring Hillary Clinton for president but backing down-ballot Republicans. Political consultant Mike Madrid, who has worked on campaigns for candidates of both parties but mostly for Republicans, said Asian voters are the GOP’s “new gamble” in California. 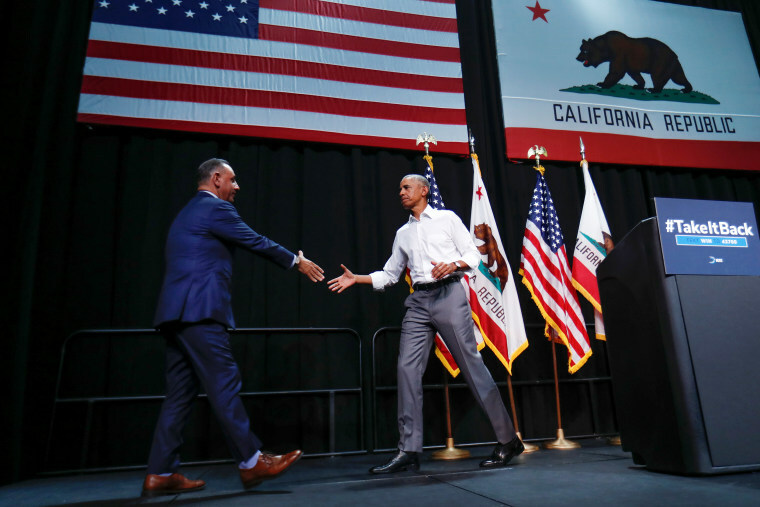 “They [Republicans] have largely written Latinos off and are trying to focus on Asian voters,” said Madrid, a principal at GrassrootsLab, a Sacramento-based public affairs lab. Republicans, said Madrid, have run into trouble with a tough stance on immigration in a district where 35 percent of the population is foreign-born and the Trump administration attempts to cut legal and family-based immigration are a concern. “As long as that exists, there’s never going to be any meaningful inroads into any minority group,” Madrid said. Still, Madrid said it is a midterm election and historical turnout in nonpresidential elections favors Republicans. He also said the white Republican female voters might have a bigger impact on the race's outcome. “I think most of those seats are safe for this cycle,” he said. There hasn’t been a Korean American in Congress since 1999 and some voters may want to change that by supporting Kim. But the 39th district’s Asian population is diverse, with people of Chinese descent being the larger subgroup. “It would be a stretch to think the ethnic voting is going to be so lockstep for her,” said Paul Mitchell, vice president at Political Data. Along with education, Cisneros said voters in the district are weary of the GOP health care agenda. “The No. 1 issue people want to talk about is health care,” Cisneros said. According to the California Health Care Foundation, 16 percent of Californians were uninsured in 2013. After the implementation of the Affordable Care Act, also known as Obamacare, the uninsured fell to 9 percent, about 2.9 million people. More than half of those who are uninsured are Latino. After the primary, Cisneros said a young mother reached out to him and told him she had spent about a half million dollars on her 8-year-old daughter’s multiple heart surgeries for her congenital heart defect. Cisneros said his own family struggled with having access to health care. His father was exposed to Agent Orange, the defoliant used in the Vietnam War and developed diabetes later in life. But at that time he had been laid off from work and lost his health insurance. He was rejected on his first attempt to get coverage through Veterans Affairs, leaving him and Cisneros’ mother without health insurance. They could not afford to buy other insurance. “My mom had to go 16 years without health insurance. My dad had to go to Mexico to get diabetes medicine,” Cisneros told NBC News. Before canvassing Sunday, Cisneros’ campaign joined astronaut Mark Kelly, husband of former Rep. Gabby Giffords, a gun violence victim. Cisneros’ mother was 10 years old when her father, Cisneros' grandfather, was killed while working in the Torrance, California, neighborhood market he owned. Though Cisneros never knew his grandfather, he said his mother always spoke about him, telling he would be proud of him when he reached milestones such as high school graduation. He said he was shaken by the Dec. 14, 2012, Sandy Hook Elementary school shootings when a gunman killed 20 children, ages 6 and 7, and six adults. “I have two young boys, 4-year-old twins," said Cisneros. "When I was a kid in elementary school, at that time we had earthquake drills and fire drills. Now kids going to school right now have active shooter drills. We need people who will go to Congress and act." A month away from the elections, Cisneros continued canvassing.